It would be far better, however, if she could just be a child. The demonstrations in Nabi Saleh were then in their third year. Israeli settlers had confiscated a spring in the valley between the village and the settlement of Halamish, and Nabi Saleh had joined a handful of other villages that chose the path of unarmed resistance, marching to protest the occupation every Friday, week after week. Ahed’s cousin, Mustafa Tamimi, had already been killed, shot in the face with a tear-gas canister fired out of the back of an Israeli army jeep. Her mother’s brother, Rushdie Tamimi, would not be killed for another few months. In November of 2012, he was shot in the back by an Israeli soldier just down the hill from her house. There was nothing unusual about any of it really, only that the tiny village didn’t stop. They kept racking up losses, and kept marching, every Friday, to the spring. They almost never got close. Most Fridays, before they reached the bend in the road, soldiers stopped them with tear gas and sundry other projectiles. The army came during the week too, usually before dawn, making arrests, searching houses, spreading fear, delivering a message that got clearer each time: your lives, your homes, your land, even your own and your children’s bodies—none of it belongs to you. Last week, the soldiers came for Ahed. It’s hard for me to understand this now, but I didn’t think it would happen to her. I thought she might be spared this, that she might be allowed to finish school and go on to university and without this interruption become the bold and brilliant woman she will surely one day be. I assumed that her brothers and her male cousins would all at some point go to jail—most of them already have—and that some of them would be injured or worse. Every time I visit Nabi Saleh and look in the children’s faces I try not to wonder who it will be, and how bad. Two Fridays ago, the day Ahed chased the soldiers from her yard, it was her cousin Mohammad, one of her little brother’s closest friends. A soldier shot him in the face. The bullet—rubber-coated but a bullet nonetheless—lodged in his skull. A week later, he was still in a medically-induced coma. 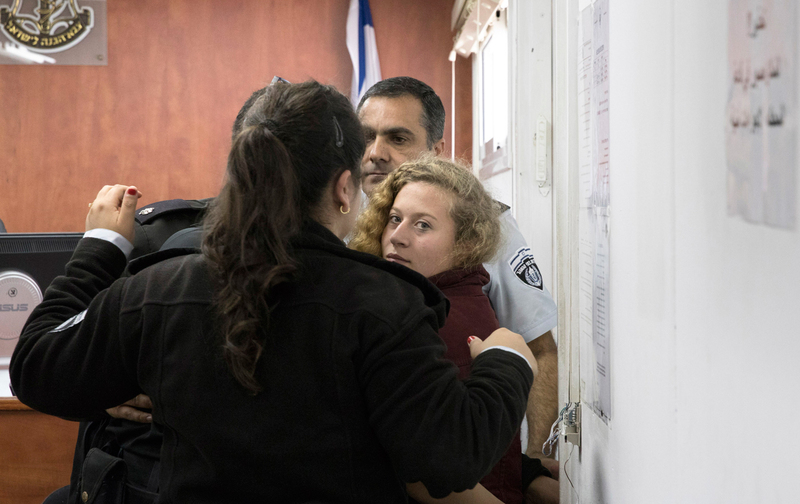 I didn’t count on the astonishing fearfulness of the Israeli public, or that a video of Ahed, unafraid, slapping a soldier to force him out of her yard, would strike such a hideous nerve. Ahed Tamimi was not jailed for breaking the law—Israel, in its governance of the land it occupies, shows little regard for legality. She was arrested because she was all over the news, and the public and the politicians were demanding that she be punished. They used words like “castrated” and “impotent” to describe how they felt when they looked at that soldier with his helmet and his body armor and his gun and at the kid in the pink T-shirt and blue windbreaker who put him to shame. For all their strength, power, wealth, and arrogance, she had put them all to shame. So far they have arrested Ahed, her mother, Nariman, and her cousin Nour, who were also in the video. They arrested Nariman when she went to the police station to see her daughter and they came back for Nour the next day. The propagandists have been hard at work spreading lies—that Ahed is not a child or is not Palestinian, that the Tamimis are not a family at all, or are every last one of them terrorists, that none of this is real, that the occupation is not an occupation and what you think you see on video is theater staged for foreigners to make Israel look bad. Anything is easier to accept than the truth—that Ahed showed them who they are, and how 50 years of occupation has hollowed them out as a nation, how it makes them weaker and more frightened every day. Please don’t make Ahed a hero. Heroes, when they are Palestinian, end up dead or behind bars. Let her be a kid. Fight to set her free, so that one day she can be an ordinary woman, in an ordinary land.